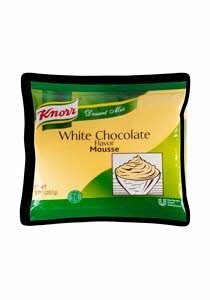 Mix that is used to create a classic white chocolate mousse, or a wide variety of signature desserts. SUGAR, HYDROGENATED COCONUT OIL, GLUCOSE SYRUP SOLIDS (WHEAT, CORN AND/OR POTATO), NONFAT MILK, GLYCERYLLACTO ESTERS OF FATTY ACIDS, SODIUM CASEINATE, HIGH OLEIC SUNFLOWER OIL, TETRASODIUM PYROPHOSPHATE, CALCIUM LACTATE, XANTHAN GUM, MALTODEXTRIN, LACTOSE, NATURAL FLAVOR, ARTIFICIAL FLAVOR, CITRIC ACID, BUTTER (CREAM), ANNATTO (COLOR), CARAMEL COLOR, LPROLINE, BETA CAROTENE (COLOR), ENZYME MODIFIED GOAT'S MILK (GOAT'S MILK, SALT, ENZYMES), MALTOL. 1. Into a mixing bowl, pour 16 oz (2 cups) of cold milk* (below 50ºF). Add contents of pouch. 2. Beat at medium speed for 2 minutes, scrape down sides of bowl, then beat at high speed for 3 to 5 minutes until fluffy and airy. Add desired flavoring and beat for 2 more minutes. Do not overbeat. For multiple pouch preparation, additional whipping time at high speed will be required to produce an airy mousse. 3. Pipe into serving dishes or use in various applications. Refrigerate. Best served when chilled 2 to 4 hours prior to service. Yield will be approximately 16 (4 fl oz) servings. *For a richer mousse half-and-half or heavy cream can be used. However, mousse yield may decrease.